The waste and recycling drawer is an interesting option for integrating the sorting of these items in your storage solution. 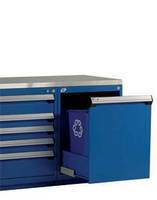 Offered in two different heights (17" and 26"), this drawer has two containers, one blue and one black, with identification on the side to facilitate the sorting of waste. Moreover, since there is a separator at the back, you can store other objects in the back of the drawer. This drawer is also offered with a locking or security system of your choice. Rack Mount Terminal Drawer features 20 in. LCD monitor.